Our first Christmas cruising was terrible. This was long before the advent of the iPhone, mind you, and the pervasive feeling that you need to document every single aspect of your life, so there are no photos from that Christmas. Let’s see if I can set the scene. The year before we left the dock, we got married in a small ceremony on my grandmother’s front lawn, in a snowstorm that caused the local propane depot to spring a leak and close down the road for five miles in each direction. We had refugees at our wedding party who couldn’t get home, since their houses were only accessible via that road. 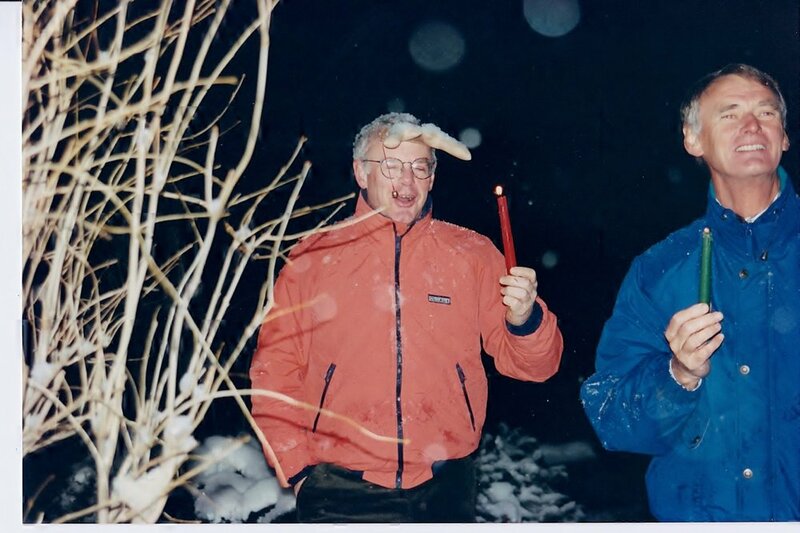 My dad and my father-in-law led us in caroling the days leading up to our wedding. There might have been bourbon involved. The wedding itself was tiny but fun-filled, from our clothing (purple stirrup pants anyone?) to the invitations (come for a party from December 26-29; Nica and Jeremy will get married sometime in there) to the fact that dogs were welcome. Christmas is largely forgotten from that year. The party atmosphere, though? Unforgettable. To say that the holiday season in 1993 was a fabulous one is an understatement. Family, celebration, love - you name it. We ate well, laughed hard, and reveled endlessly. The next year, we were anchored somewhere in Florida, waiting to cross the Gulf Stream to the Bahamas. There were 3 other boats in the anchorage, and we were going to invite them all over to join us. I had provisioned a special dinner for us - canned ham, canned potatoes, and canned green beans. One by one, the other boats left the anchorage. The ham was slimy, the potatoes weirdly chlorine-y, and the green beans mush. We ate alone in the surprisingly cold early dark of Florida in late December and I think I cried myself to sleep. Was cruising going to be lonely, inedible, and strange? This was, I can tell you, the low point of holidays on board. We’ve had seriously memorable ones (memorable in a good way) since then. There was the Thanksgiving we celebrated in Grenada with Darren and Sherry, Canadians on Elixir, on their boat, with pork loin and stewed cabbage, laughing about the differences between countries and their celebrations. The Thanksgiving (Christmas? I forget which one.) we spent at Chacachacare in Trinidad, crews of 5 boats (Calypso, Eos, Little Gidding, Red Baron, and Phaedrus) ferrying dishes and table linens and plates from the anchorage to shore as we set up in the abandoned buildings of the leper colony of that offshore island. Nina on Red Baron even made napkins for all of us for that dinner. There was Christmas spent in Puerto Rico, at Roosevelt Roads Naval Station, with people we’d met via ham radio. Thanksgiving with just our little family of 4 on board Calypso in Double Breasted Cays, in the Bahamas, followed closely by Christmas in Hope Town with our extended family and friends in a pack of 25. One thing I love about cruising holidays is how we make of them what we will. The focus is so solidly on connection, whether that’s connection just on board or a connection with a larger group of people. Even on land, now, I am trying to apply those lessons. Last Christmas? We were with our great cruising buddies from Osprey, all together in a house on the Outer Banks of North Carolina. We cooked together, laughed together, and watched their dog Maya (rescued from an island in the Guna Yala of Panama when they were anchored there) gleefully destroy a smuggled-in coconut husk on the rug on Christmas morning. See the coconut husk detritus? This lesson was missing from our first Christmas, at least the part about connecting with ourselves. I’m not sure I even realized this until just now, honestly. Sure, the terrible food didn’t help at all (note to self - canned potatoes and canned green beans are not worth the space they take up) but now, as we contemplate the next cruising phase of our lives, I find myself looking forward to simple grounded holiday celebrations. And who knows. Maybe we’ll share an anchorage, and a sundowner or more, and toast together to our incredible joy in being able to celebrate life.